This simple buying guide has been put together to give you a brief introduction into MMA Gloves and as an explanation of their common features and uses. WHY SHOULD I BUY SEPARATE GLOVES FOR MMA? ai??? MMA Gloves are designed to help you seamlessly adapt between striking and grappling as well as provide protection for your hands and wrists as well as your opponent. ai??? With their fingerless design (or use of finger loops on MMA Sparring Gloves) MMA Gloves keep your hands free for grappling. The varying degrees of padding offers up protection for your knuckles when striking. ai??? Certain wrist enclosures on some brands also provide additional wrist support and protection too. 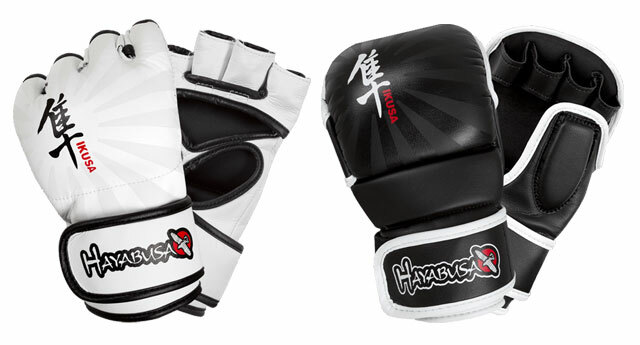 The wrist support used on the Hayabusa MMA Gloves and in particular their Tokushu Series MMA Gloves are excellent examples of this. 4ozAi??-Ai? ?The regulation and widely approved weight for MMA competitions. 7oz -Ai? ?The typical (although not universal) weight of the MMA Hybrid or MMA Sparring Glove. 4oz MMA GLOVES or 7oz MMA SPARRING GLOVES? ai??? Deciding on the weight that is best for you is all down to what you intend to use them for. ai??? For competition and grappling training we would recommend the 4oz MMA Gloves. ai??? For training that will include both grappling and light sparring then we would recommend the 7oz MMA Sparring Gloves. 7oz weight gloves will have more padding and offer more protection for you and your training partner. ai??? Heavy Bag Work -Ai?? We do not recommend any kind of MMA Gloves for this type of training. ai??? We recommend that you invest in a pair specifically designed Heavy Bag Gloves to make sure that your hands and wrists receive the right amount of protection. ai??? Heavy Sparring -Ai? ?MMA Gloves will not provide the padding protection needed for safe Heavy Sparring. ai???Ai? ?In the interests of protection for both yourself and your training partner, we would advise that you invest in a pair of Sparring Gloves for Heavy Sparring Sessions. Click Here to view the full range of MMA Gloves available from MMA Fightwear. This entry was posted in Buying Gudes on 15.05.2014 by MMAFightwear.